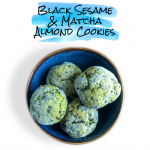 They say you eat with your eyes first, which makes these eye-catching vivid green cookies with deep black sesame seed such a treat! The intense colors in this dish are all natural – the pigment comes from the matcha green tea powder. Black sesame and matcha are one of the power couples of Japanese desserts. You’ll find a wide variety of tea cakes, boba milk teas, mochi, and cookies made with this combination. Today’s treat isn’t traditional, it’s a combination of two of my favorite treats – Matcha Lattes and Amaretti Cookies. And great news for the Dairy-Free and Gluten-Free folks out there, this recipe doesn’t require any weird substitutes. All the ingredients are easy to buy and can be purchased at most well-stocked grocers. Japan meets Italy for a sensational cookie! Preheat the oven to 325 F or 165 C and line a baking sheet with parchment paper. Whisk the egg until reach the soft peak stage. In a separate bowl stir together the almond flour, sugar, matcha, vanilla extract and Black Sesame Seeds. Stir the egg whites into the dry ingredients. Stir until all the dry ingredients look damp. The dough should look crumbly, but it will hold together. Form the dough into 12 small balls using your hands. Be careful not to over roll, as they may start to crumble again. Roll each of the balls in white sugar to coat the outside. I usually put a small amount of sugar in a small bowl and roll each cookie individually in the sugar. Place each cookie on the parchment paper, and bake for 25 minutes. You'll know they're done when the bottoms are a deep toasted brown. This recipe is easily scaled up. This batch is the smallest batch size available and makes 12 cookies, but you can ramp up the batch size as much as you want.